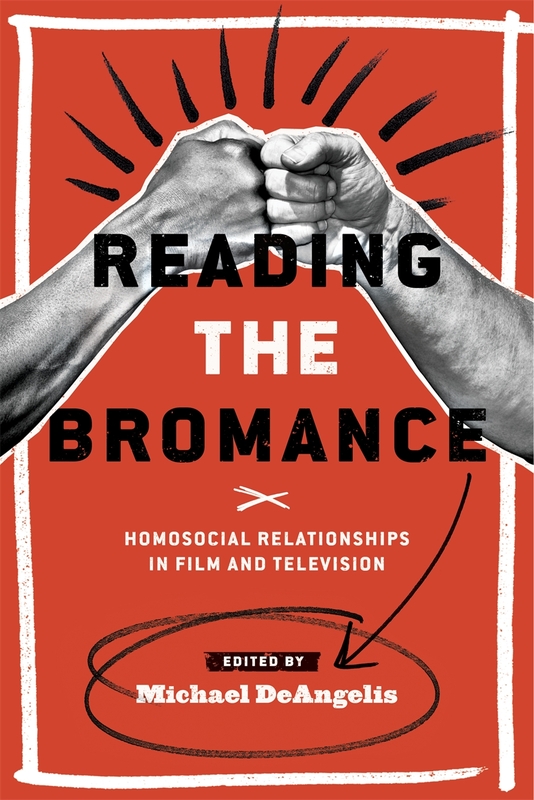 I’m very thrilled to have my work included in this terrific new book on the ‘bromance’ phenomenon, Reading the Bromance: Homosocial Relationships in Film and Television, edited by the wonderful Michael DeAngelis (DePaul University), out in June from Wayne State University Press in both print and ebook formats. Reading the Bromance examines a wide range of films and TV shows replete with bromantic affection. As well discussion and analysis of bromance staples like The 40-year-old Virgin (2005), Knocked Up (2007), Superbad (2007), and I Love You, Man (2009), the book also focuses analytical attention on texts like Grumpy Old Men (1993), TV’s House, and Scream (1996); it addresses cross-cultural bromances as well, buddies in Hindi cinema, and much more. Readers will find discussion of men engaged in bromance’s obsession with mimicking homosexuality while insisting that these displays are indeed only mimicry. My chapter is titled “‘This ain’t about your money, bro. Your boy gave you up’: Bromance and Breakup in HBO’s The Wire.” As its title indicates, this piece focuses on the acclaimed HBO crime drama The Wire. This show probably isn’t the first thing that jumps to mind when one thinks of bromance, yet The Wire abounds with close male partnerships. Centrally and critically celebrated is the relationship between drug kingpin Avon Barksdale (Wood Harris) and his right-hand man, Russell “Stringer” Bell (Idris Elba), which is phrased in terms of family but—I argue—consolidated in a series of romantic and virtually sexual gestures. Authors include Hilary Radner, David Greven, Nick Davis, Meheli Sen, Jenna Weinman, Ken Feil, Peter Forster, Ron Becker, Murray Pomerance, and editor Michael DeAngelis. Everything you always wanted to know about the bromance, but were afraid to ask! This new volume explores contemporary masculinity, homosocial desire, and homosexual/homophobic knowing as it plays out across film and TV texts such as I Love You, Man, Superbad, The Wire, Jackass, and Humpday. In thoughtful and provocative ways, DeAngelis and his authors cover the history, forms, and multiple meanings of this curious phenomenon. Essential reading for anyone interested in contemporary models of gender and sexuality. This lively and perceptive collection of essays posits the ‘bromance’ film as an ambivalent response to gay liberation and the women’s movement that allows for expanded representations of male intimacy even when operating within heteronormativity. Reading the Bromance is a valuable volume for those who want to understand the role of gender and sexuality in contemporary popular cinema. Reading the Bromance‘s remarkably sophisticated essays analyze the twisted generic complexity of a long history of representing male-male relations. Studying the formula’s homosocial and heteronormative behaviors, these authors demonstrate how these texts permit fluid cultural and social adventures involving emotions, maturity, gender, taste, and physicality. A terrific collection. – Janet Staiger, William P. Hobby Centennial Professor Emeritus in Communication and Professor Emeritus of Women’s and Gender Studies. Reading the Bromance is available in June from Wayne State University Press.